At Little Sparkie Electric, we specialize in service work! We frequently put on our detective hats as we track down electrical issues, ask and answer questions, and offer suggestions. Our goal is to give you the results you need – and more – while ensuring that projects meet or exceed all building and safety codes. Diagnose and repair problems with lights, lighting controls, and motor controls that don’t work or work properly. Lighting upgrades and retrofits, including converting to LED and updated controls. Diagnose and repair problems with receptacles and other electrical equipment that doesn’t work or work properly. Disaster damage evaluation and reconstruction from fires, floods and lightning. 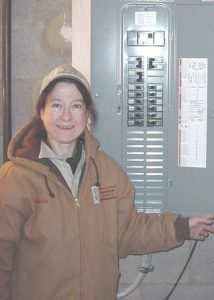 Generators and transfer switch maintenance and repairs. Sometimes I can talk a customer through a problem, and a service call isn’t needed! Recently, Catherine Nazarene, owner of Little Sparkie Electric, worked with Misty Ridge Kennel and Animal Resort to diagnose and repair problems with exterior barn lights that weren’t working, and solved problems in the farmhouse with lights that weren’t working properly. Sometimes it can be tempting to procrastinate on service work. But here are some projects Little Sparkie recently completed that could have led to catastrophes! A historic inn had mis-wired kitchen receptacles that fortunately burned through a neutral wire and cut off power to the circuit. There were singe marks on a stud next to a melted box and a burned receptacle (it was one of two receptacles that were affected). It almost caused a fire! A plumbing and heating company had a substation problem, which caused the utility coil in a transfer switch to burn up. We bypassed the transfer assembly until parts arrived, and then installed them. A local insurance agency had a computer receptacle sparking because of bad connections. “It could have turned into a fire if they hadn’t called us; I went there around 8 p.m. to fix the problem,” said Catherine. At a dog spa, a dog chewed on the cord to the cage fan, which left live conductors exposed. We replaced the plug. At an assisted living facility, a garbage truck bent roof mast and left incoming wires drooping too low to the ground. We trenched under the driveway and converted the service from overhead to underground and also moved the breaker panel outside because it was in a bathroom (which is a code violation)! A fast food restaurant had bad electrical connections either in the steam table plug or a receptacle that melted both. A live prong was sticking out of receptacle! The, breaker was not tripped, and there was a greasy floor. The problem happened at 4:30pm on a Friday just before peak dinner hour. We replaced both the plug and the receptacle. A customer had a live arcing fault in an attic junction box that was buried in insulation! We heard the noise but there wasn’t time to isolate the culprit. We cut off all of the single-pole breakers, then traced out the wires and repaired them. We also installed a new junction box. A residential emergency involving a problem with an air handler caused two breakers to partially melt and damaged the breaker panel. The issue arose in January, and as a result the residents had no heat. We swapped out the breaker panel, which restored power. We still have all of the affected original charred materials and exhibit them at trade shows.